To create my pieces, I hand-encase fine gemstones with precious metal strands (various gold carat weights and sterling silver) to both hold the gems securely and artfully display them. 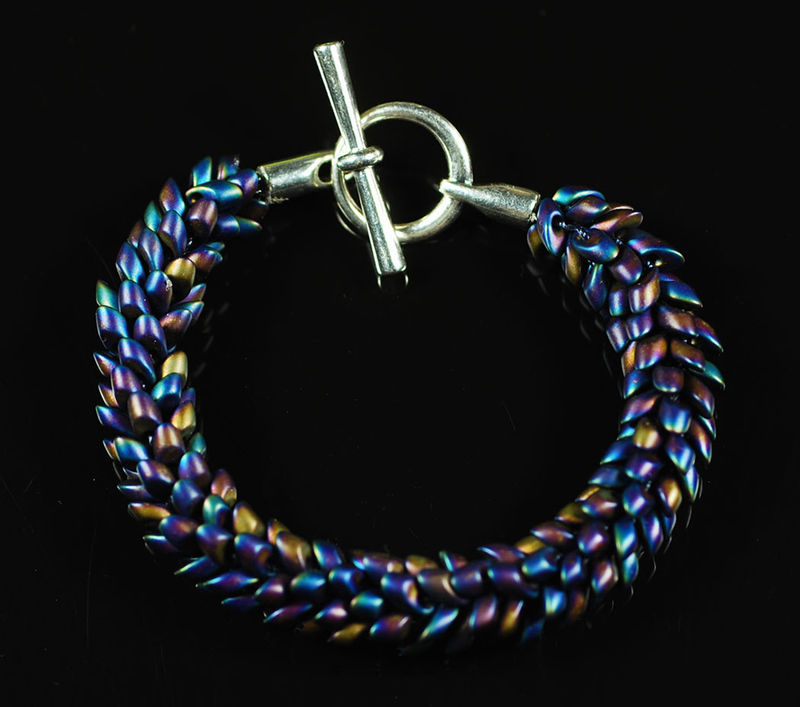 The techniques I use are time consuming, but yield results unlike jewelry made with other methods. My wire artwork is perfect to showcase rare gems or unusually-shaped stones or crystals. Because I form the metal filament by hand into a tight chassis around the gem, any kind of shape can be turned into fine jewelry with no alterations to the natural stone. I never use solder or glues, so every gem is perfectly preserved in its original state. I also make all clasps, hooks, and eyes, so my collectors have jewelry that is truly made by hand. Every piece that I create has a powerful focal point, whether it be a gem, a crystal, a mineral, or an unusual object like a shark’s tooth. I then use metalwork to enhance the stone’s beauty, not compete with it. This is an important distinction of my approach. I eschew extreme ornamentation, seeking harmony and simplicity instead. It has taken me years of learning, practice, and experimentation to strike the right balance between the power of the stones and the precious metals. Since my wire art technique works with any kind of shape, I actively seek out exotic stones from around the world, and showcase Arizona gemstones and cabochons. My clients get to see gems and minerals that they might not ever see elsewhere and I love sharing the history and mythology of these rare minerals. I have a constant supply of ideas for new pieces, but usually my vision is more complex than the traditional techniques can accommodate. Such roadblocks tend to inspire me to develop brand new techniques to bring my ideas to fruition. These innovations allow me to make jewelry that mechanically cannot be replicated by others; many of my pieces take over 120 process steps from beginning to end. I recently took a two-year sabbatical to explore new directions in my wire work. Now, armed with new techniques and a dazzling collection, I am eager to rejoin the Celebration of Fine Art family. Although my work is sold in a gallery, I sell the lionfs share of my work directly to collectors. I have participated in over 100 juried shows and enjoyed featured artist status multiple times. My show experience includes a successful 11-year run at the Celebration of Fine Art show from 2002 to 2012. My work is in over 1000 private collections worldwide, including a Mabe pearl pendant owned by actress Shirley MacLaine. Accredited Jewelry Professional degree, Gemological Institute of America, 2007 Curriculum included legal issues; precious metals; cleaning, cutting, polishing,and hardness scales of faceted gemstones; clarity, values, and mining methods of diamonds. Graduate Pearl Degree, Gemological Institute of America, 2008 Curriculum included history, farming, harvesting, cleaning, grading, and sizing of pearls. Author, The Fine Art of Wire Art Jewelry, publication pending. This book forms the instructional core of my six-week wire wrap jewelry course. McGuire. Krause Publications, April 2001. My work is in over 1000 private collections worldwide, including a Mabé pearl pendant owned by actress/author Shirley MacLaine. I have developed a six-week wire art jewelry course offering 24 hours of personal instruction. Students attend from all over the country to learn my specialized techniques. Have you ever been house hunting and walked into a place that immediately felt like home? That was the experience Ann Turpin Thayer had when she discovered the art form of wire jewelry. 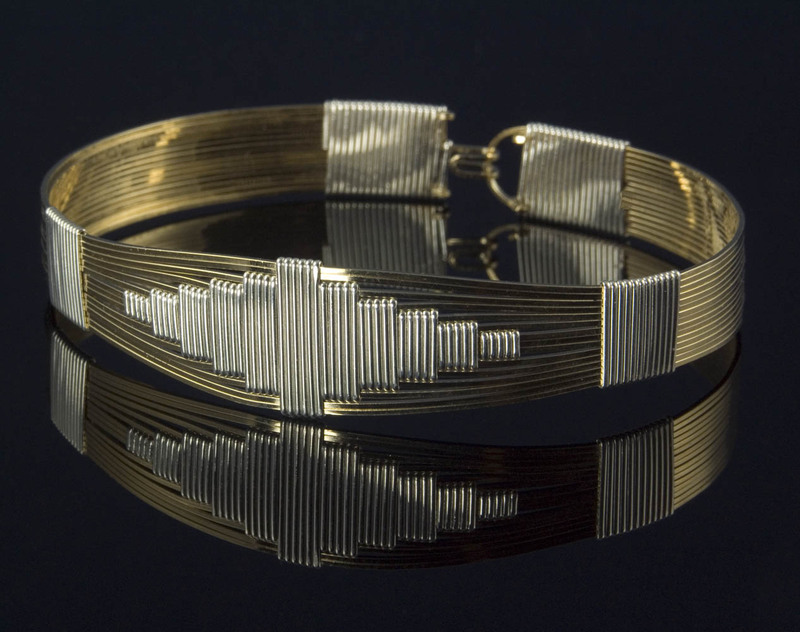 Although Ann had always worked as an artisan, when she discovered wire jewelry art, she knew that this was the medium that she had been seeking to explore her creative gifts. Ann had even been preparing for the career without knowing it.she had been playing 12-string guitar for years, so her hands had already developed the strength needed for exacting metal wrapping. To do justice to the rich wire art tradition and to educate her clients, Ann has completed a rigorous formal education in gemology (Accredited Jewelry Professional [GIA] and Graduate Pearl Degree [GIA]). 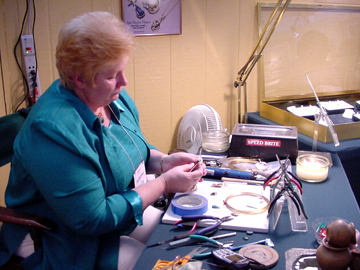 This training allows Ann to guarantee—in writing— the quality and composition of stones she uses. 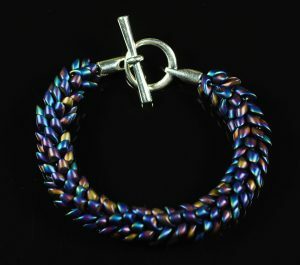 In addition to her gemology credentials, Ann has recently expanded her repertoire of wire art techniques to include filigree wire work, Viking knit chains, platinum and pearl combinations, and Kumihomo, a Japanese braiding technique usually reserved for ribbon or cord. Ann has participated in over 100 juried shows and exhibitions, including many designations as featured artist. Her work is in more than 1,000 private collections and attracts both women and men collectors who are enchanted by her meticulous hand wire work and tasteful designs.